Is it wrong that this morning I spent so much time wandering through Ravelry and thinking about what socks I’d like to make and all the fun yarn I have that I could make socks with, that I was halfway through a session of winding yarn before it occurred to me that I hadn’t even had breakfast yet? Well, if winding yarn is wrong, then I don’t want to be right. But I have since fixed the lack of breakfast. Also, in answer to my decision-making needs on Tuesday…I started some Charades. I love them, along with the Cherry Tree Hill Supersock I’ve been hoarding. The colours are fun, and the pattern is fun, and I am surrounded by other fun yarns and other fun patterns and I would like to knit them and all of their sock yarn kin all day, but somehow I think that might be a problem for my to-do list. We shall see. You could wind my yarn– Its tedious for me without a swift… I have those socks in my queue– of course you beat me to them. Sounds like a perfect morning. Who needs food when we have yarn? If only it really worked that way. sigh. Cherry Tree Hill yarn wears so well! Worth every penny. 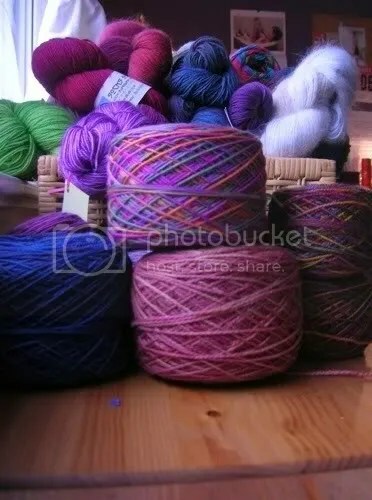 Ooh, such pretty stacks of yarn! The charade sock is looking great. I love those gorgeous yarn cakes! Yum! Yea, I don’t wanna be right either. My Smooshy Charades are one of my favouritest pairs ever! 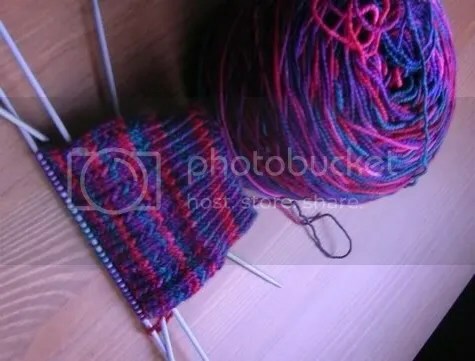 I want to knit all my sock yarn now except for there’s the time-space continuum and only one pair of hands. Lovely yarns, its a great way to work up an appetite for breakfast! Mmmm mmm mmmm, luscious juicy sock yarns, what a visual treat! So are those socks! We’ve ALLLLL been there. What was I supposed to do today? Something other than cast on??? Reallllly??? Not wrong, just very common for knitters, I think. 😉 For me, it’s often right before bedtime – “I’ll just check this out, and then I’ll go to bed. I’ll just take a quick look- ooh! That one’s pretty! I wonder what else she made.. What’s that pattern? Awesome! Do I have the yarn for that? No… Huh. What else have people used? Oh that one’s really pretty too!! I wonder what else she made…” and then all of a sudden it’s 1:14 in the morning and your bedtime was half past eleven. Knit all the socks you want! I have spent most of the day on this computer that I never feel like I get enough time on! So enjoy it while you can! I can’t wait to see the end result!